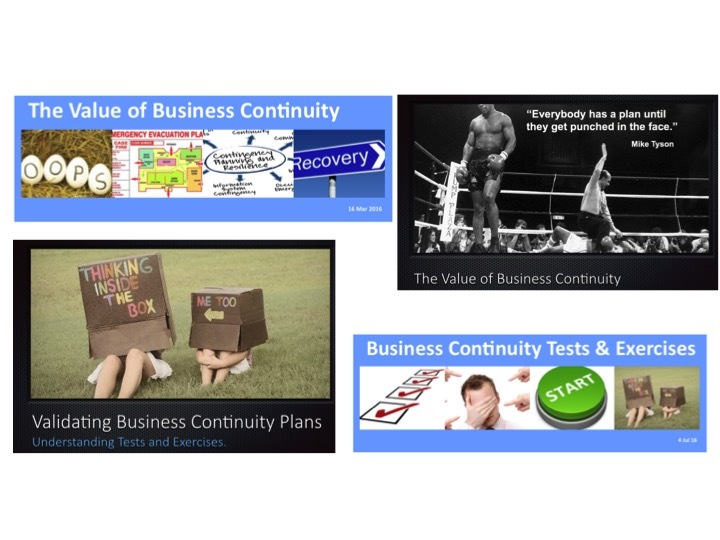 Having a business continuity policy and plan is only part of the solution when it comes to developing a continuity capability. Capability is much more about people than it is about having reams of paper. You need to be sure your people have the abilities to recognise trigger events, respond appropriately, play their part in teams and think critically and creatively in developing continuity solutions, Of course well founded and thought through plans are a necessary part of any continuity capability. They are also that aspect of any continuity capability which can be more easily accounted for as, at the superficial level at least, we either have up to date policies and plans or we don’t. However it is as important to consider the value of promoting your continuity capability to your people. Are they as ‘up to date’ as you need them to be? Really being certain that your people have the base knowledge, skills, experience and traits that combined make up the competencies needed to manage a business disruption can be a challenge. As these events are not routine you can’t just assume that people will intuitively know what to do, how to do it, why it needs to be done, when it needs done by and what others will be doing. You therefore need to put in place an education programme as a first step in promoting your continuity capability and in raising the continuity competency bar of your people. So here are a few tips as to the types of things you can do to help raise initial awareness of your business continuity capability. General Awareness: It will be important to ensure that general staff are aware of the basic principles of continuity and their likely roles, such as taking part in exercises or tests or raising continuity concerns they spot. This can be done through targeted newsletters, toolbox talks posters and short notices on payslips or PC login screens. Set a theme for a quarter and follow this through. Keep the messages simple and easy to digest. Make them relevant to the home and personal lives of the people reading them and then make the link to the business world. If it makes sense to have ‘continuity’ at home then it makes sense at work too. Role Awareness: Staff with specific roles will need to be reminded of these roles and the value they bring. Briefing sheets that are targeted to specific people and teams will stand a better chance of being engaged with, especially if they help clarify points relating to the role and how it operates within the context of the overall continuity structures. Supplier Awareness: Continuity requires the support of third parties, such as suppliers. Make sure that your critical suppliers know what is meant by continuity and why you will both rely on them and support them in the event of a disruption. Remember that should something go wrong with your business it may well be a worry for them also. Multimedia: Try to use a mix of media to get the messages across. People respond differently to various media formats. Try a mix of articles, diagrams, presentations, verbal briefings and video. Remember to monitor what works best for you in promoting your continuity capability.